Rechargeable lithium-ion (Li-ion) batteries are the dominant technology not only for portable electronics but it also is becoming the battery of choice for electric-vehicle and electric-grid energy-storage applications. In a Li-ion battery, the cathode (positive electrode) is a lithium metal oxide while the anode (negative electrode) is graphite. But researchers are looking for ways to replace graphite with lithium metal as the anode to boost the battery’s energy density. Lithium metal-based batteries such as Li–sulfur and Li–air batteries have received considerable attention because the packing density of lithium atoms is the highest in its metallic form and Li metal can store 10 times more energy than graphite. However, there are safety and performance concerns for these types of batteries that arise from the formation of dendrites on the metal electrodes; an issue that has been known and investigated since the 1960s. These dendrites form when metal ions accumulate on the surface of the battery’s electrodes as the electrode degrades during the charging process. Dendrites are often responsible for the highly publicized violent battery failures reported in the news. When these branch-like filament deposits elongate until they penetrate the barrier between the two halves of the battery, they can cause electrical shorts, overheating and fires. They also cause significant cycling efficiency losses. To avoid dendrites, researchers are experimenting with new battery electrolyte chemistries, new separator technologies, and new physical hosts for the lithium metal. Carbon hosts, in particular, are very promising, since they may be added to the anode with little additional cost and minimal modification of the manufacturing process and they are becoming an important way to stabilize Li metal anodes. However, there are seemingly contradictory findings reported in hundreds of prior publications on the subject: The hosts, which are predominantly made from various nanostructured carbons such as graphene, are in some cases very effective in eliminating dendrites. In other cases, they don’t work at all, or actually make the dendrite problem worse. Up to now, design of such host systems has been largely Edisonian: researchers use a trial-and-error approach to find an architecture/structure that works better than the rest. In new work featured on the front cover of Advanced Energy Materials (“Pristine or Highly Defective? 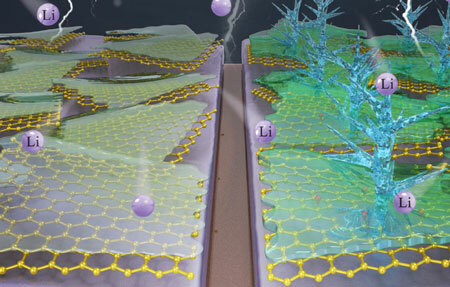 Understanding the Role of Graphene Structure for Stable Lithium Metal Plating”), a research team from Sichuan University in China and Clarkson University in the U.S. have discovered a key design rule for Li metal batteries: If you want to suppress dendrites, you have to use a defect-free host. More generally, carbon defects catalyze dendrite growth in metal anodes. These findings address the major scientific problem of explaining how the structure and chemistry of the carbon per se affects dendrite growth. The team hypothesized that it was the host structure/chemistry that mattered, but needed to create ideal model systems to test the hypothesis. Prof. Wei Liu’s unique Flow Assisted Sonication (FAS) approach allowed them to create nearly defect-free graphene. Literally, such oxygen-free and structural defect-free graphene has never been synthesized prior by a wet chemistry method. This graphene is 1-3 atomic layers thick and with only about one and a half percent oxygen. This is much purer than the typical eight percent or more oxygen found in most graphene materials. He emphasizes that this in itself is a transformative accomplishment for the carbon and energy communities, since prior only vapor deposition could obtain such ideal defect-free structures. The team then compared their defect-free graphene to a standard highly defective Hummers graphene baseline found in literature. Going forward, the researchers plan to commercialize defect-free graphene host materials for next- generation lithium batteries. They also plan to further understand the complex relationship between carbon defects and metal dendrites by examining carbons with tuned structure/chemistry for lithium, sodium and potassium batteries. Your knees and your smartphone battery have some surprisingly similar needs, a University of Michigan professor has discovered, and that new insight has led to a “structural battery” prototype that incorporates a cartilage-like material to make the batteries highly durable and easy to shape. The idea behind structural batteries is to store energy in structural components — the wing of a drone or the bumper of an electric vehicle, for example. They’ve been a long-term goal for researchers and industry because they could reduce weight and extend range. But structural batteries have so far been heavy, short-lived or unsafe. To sidestep these trade-offs, the researchers used zinc — a legitimate structural material — and branched nanofibers that resemble the collagen fibers of cartilage. In the batteries, aramid nanofibers — the stuff in bulletproof vests — stand in for collagen, with polyethylene oxide (a chain-like, carbon-based molecule) and a zinc salt replacing soft components of cartilage. To make working cells, the team paired the zinc electrodes with manganese oxide — the combination found in standard alkaline batteries. But in the rechargeable batteries, the cartilage-like membrane replaces the standard separator and alkaline electrolyte. As secondary batteries on drones, the zinc cells can extend the flight time by 5 to 25 percent — depending on the battery size, mass of the drone and flight conditions. A team of material researchers has succeeded in producing a composite material that is particularly suited for electrodes in lithium batteries. The nanocomposite material might help to significantly increase the storage capacity and lifetime of batteries as well as their charging speed. One way of addressing this problem is hybrid materials or nanocomposites — composite materials that contain nanoparticles. The scientists developed a material comprising tin oxide nanoparticles enriched with antimony, on a base layer of graphene. The graphene basis aids the structural stability and conductivity of the material. The tin oxide particles are less than three nanometres in size — in other words less than three millionths of a millimetre — and are directly “grown” on the graphene. The small size of the particle and its good contact with the graphene layer also improves its tolerance to volume changes — the lithium cell becomes more stable and lasts longer. “Such high energy densities were only previously achieved with low charging rates,” says Fattakhova-Rohlfing. “Faster charging cycles always led to a quick reduction in capacity.” The antimony-doped anodes developed by the scientists, however, retain 77 % of their original capacity even after 1,000 cycles. Maintaining a global supply chain is one of the most secretive and understated keys to the success of a military campaign. As described by the U.S. Army, the quick and efficient transport of goods like water, food, fuel, and ammunition has been essential in winning wars for thousands of years. Supply chain and logistics management has evolved to include, “storage of goods, services, and related information between the point of origin and the point of consumption”. In essence, that means the movement of vehicles bringing precious cargo from the home base to the soldiers fighting on the front lines. Security and strategic operations are critical elements in the fulfillment of this potentially hazardous supply chain. Enemy forces hiding in the bushes can open fire to try to slow down the troops’ movement. With mines littered all over the war zone, all it would take is one wrong step, and the truck and the people in them, would be blown to smithereens. One ingenious solution is the deployment of an automated military convoy run by a military commander, which can reduce risks and their accompanying vulnerabilities. In line with this, advanced defense contractor Lockheed Martin Canada (NYSE:LMT) has successfully tested “driverless trucks” on two active U.S. military bases. Call it the soldier’s equivalent of a smart fleet of cars that would take the currently popular concept of self-driving vehicles to a whole new, safer level. Human operators would still be needed to guide the vehicles towards their destinations. However, because this could be accomplished remotely, very little time would be lost to the exchange of hostilities, as these smart military vehicles would be impervious to the enemy’s usual attempts at distraction. And in case firepower does break out, the loss of life, as well as injury to the troops, would be minimal. The memorandum of agreement signed between Elcora and Lockheed Martin, is not the usual corporate alliance but bears important long-term repercussions for sectors such as transport, security, and the military-industrial complex. Lockheed Martin is a leviathan in the aerospace, defense, weaponry, and other technologies that have been instrumental in keeping many of the nations of the world safe. The Lithium-ion (or Li-ion) batteries that it uses to store energy in many of its technologies and processes are critical to upholding the operations being conducted in many of its devices, plants, and facilities. The more energy that these batteries can store, the longer the systems and machines can function, without interruption, and in compliance with the highest standards of safety. This is where Elcora comes in. The future of military supply chain and logistics management is accelerating thanks to Lockheed’s recently signed partnership with end-to-end graphene producer Elcora Advanced Materials (TXSV:ERA, OTC:ECORF). One element that can ensure the consistent and reliable powering up for the Li-ion batteries is graphene, an element derived from graphite minerals. Elcora is one of the few companies that produce and distribute graphene in one dynamic end-to-end operation, from the time that the first rocks are mined in Sri Lanka, to the time that they are refined, developed, and purified in the company’s facilities in Canada. The quality of the graphene that comes out of Elcora’s pipeline is higher than those usually found in the market. This pristine quality can help the Li-ion batteries increase their storage of power without adding further cost. Li-ion batteries are already being sought after for prolonging the lifespan of power charged in a wide range of devices, from the ubiquitous smartphones, to the electric cars that innovators like Elon Musk are pushing to become more mainstream in our roads and highways. Lockheed Martin will also be using them in the military vehicles that will be guided by their Autonomous Mobility Applique Systems (AMAS), or the ‘driverless military convoy’, as described above. The tests have shown that these near-smart vehicles have already clocked in 55,000 miles. Lockheed is looking forward to completing the tests and fast-forwarding to deploying them for actual use in military campaigns. The importance of long-lasting Li-ion batteries in the kind of combat arena that Lockheed Martin is expert in cannot be overestimated. With electric storage given a lengthier lifespan by the graphene anode in the batteries, the military commanders guiding the smart convoys do not have to fear any anticipated technical breakdown. They can also count on the batteries to sustain the vehicles’ power and carry them through to the completion of their mission if something unexpected happens. The juice in those Li-ion batteries will last longer, which is critical in crises such as the sudden appearance of combatants. Sometimes, the winner in war turns out to be the force that is the more resilient and sustaining power. As the ancient Chinese master of war Sun Tzu had warned eons ago, sometimes “the line between order and disorder”—or victory or defeat—“lies in logistics.” Through its graphene-constituted Li-ion batteries, The Lockheed Martin-Elcora alliance can certainly enhance any military force’s capacity in that area. Super Capacitor Assisted Silicon Nanowire and Graphene Batteries for EV and Small Form Factor Markets. A New Class of Battery /Energy Storage Materials is being developed to support the Energy Dense – High Capacity – High Performance High Cycle Battery and Super Capacitor Markets. Researchers have demonstrated a novel approach toward smart orthodontics based on near-infrared red light from a mechanically flexible LED powered by flexible bio-safe batteries all integrated in a single 3D-printed dental brace. As the team from King Abdullah University of Science and Technology (KAUST) demonstrates in their paper in NPJ Flexible Electronics (“Flexible and biocompatible high-performance solid-state micro-battery for implantable orthodontic system”), integration of red light therapy enhances bone regeneration, reducing overall time to wear the dental brace and unburdening users from expense. Furthermore, 3D printing allows personalized (instead of one size fits all) transparent dental brace. The scientific core of the team’s findings is to approach flexible energy storage solutions in a way that is pragmatic, fast and well integrated with other components. A major challenge to integrate any traditional lithium-based energy storage is their toxicity. The scientists circumvented this issue by introducing non-toxic micro-scale flexible batteries to be used as on-demand power supply. 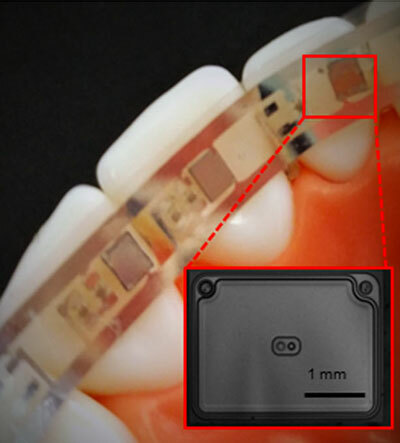 Furthermore, they integrated near-infrared (NIR) capability as well as an optoelectronic system of light emitting diodes (LED) arrays in a personalized, 3D-printed semi-transparent dental brace. Of course, such a device would not have been possible without an appropriate energy storage solution. Key to this smart brace is the use of a high-performance flexible solid-state microbattery. A standalone all thin-film lithium-ion battery already can be readily thinned down to about 30 microns thickness to achieve flexibility. The team’s flexing process for thin-film-based micro-batteries achieves two major objectives: 1) utilization of mature and reliable CMOS process with 90% yield and repeated electrochemical measurements on multiple devices, and 2) the ability to withstand high annealing temperatures of cathode material or soldering that are unachievable using direct film deposition on plastic substrates. Continuous intra-oral NIR light therapy for patients is becoming a growing necessity for accelerating the rate of the bone remodeling process. Near-infrared light can be absorbed by bone cells to stimulate the bone regeneration for faster orthodontic treatment. That’s why the team integrated near-infrared LEDs with the flexible batteries and interconnected them on a soft PET substrate. The whole device is embedded in semi-transparent 3D-printed brace. To summarize, this smart dental brace relies on two main functionalities: Firstly, a customizable, personalized, and semitransparent brace, which provides required external loading to stimulate healthy rebuilding of bone structures. Secondly, a miniaturized, soft, biocompatible optoelectronic system for an intraoral (conformable on the mouth) near-infrared light therapy, which allows rapid, temporally specific control of osteogenic cell activity via targeted exposure and light sensitive proteins present in bone cells.